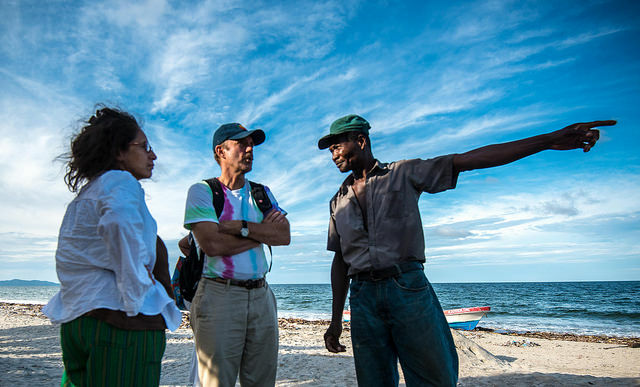 Journey into Garifuna territories “to die for”! Photo by Steve Pavey, One Horizon. Part I: When Garifuna communities get into trouble, they call OFRANEH, the National Fraternal Black Organization of Honduras. One cannot say too much of the importance of OFRANEH. We of Agricultural Missions are proud to have worked with OFRANEH since the 1990s! In the video you will see heavily armed men, most from the army, and a “judge executor” bearing an eviction order. The first attempt on September 19 failed because the eviction order named two individuals and not the community of Barra Vieja. We learned from local residents that when they returned around 6 p.m. with a hastily modified order (doctored and xeroxed at the nearby INDURA hotel complex), OFRANEH leaders present cited the Honduran law that prevents evictions after 6 p.m. On September 30, early in the morning the eviction party was back, on what appeared to be a properly worded and signed document*. (I had had a long conversation with the judge who had signed that order, who basically contended that she had no alternative, as the order had come from the Ceiba Court of Appeals and the Public Ministry had rejected an order of arrest for individuals she had originally signed, in favor of a wholesale eviction of the community she felt compelled to sign. In our conversation, this same judge ignored or was ignorant of the concept and applicability of collective land titles for indigenous peoples protected under Convention 169 of the International Labor Organization.) Along with the heavily armed soldiers was a truck load of what appeared to be campesinos (farmers) who had been “employed” to do the heavy lifting of removing all the belongings of the Garifuna residents from their homes, so that the soldiers and police would not have to. 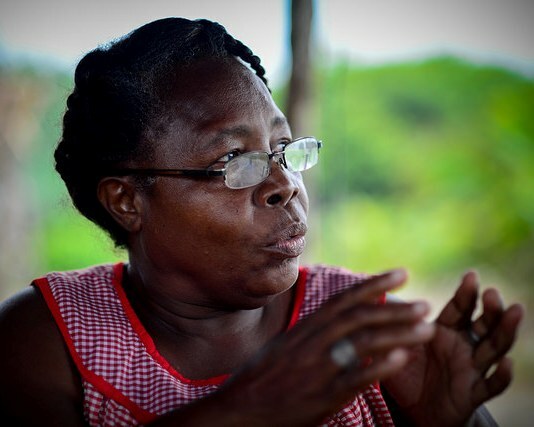 OFRANEH and Barra Vieja leaders successfully argued that this use of third parties was illegal in an eviction and would put the property of the Garifuna at risk; that it represented an additional threat of plunder. A typical home in Barra Vieja, photo by Steve Pavey. By this time, the military and police units assigned to do this eviction were beginning to lose their enthusiasm. 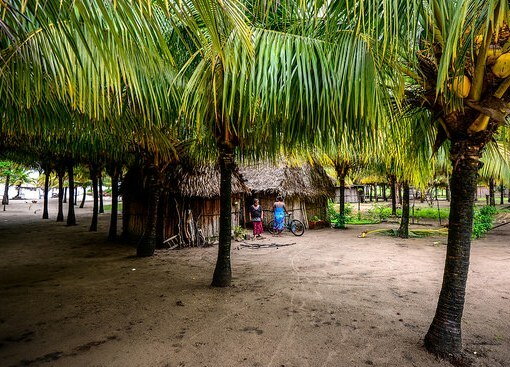 Under the non-violent and strong resistance of the community, they took a new tack and convinced the residents to help them remove their property from the humble thatched homes so that they could take photos showing their bosses that they had completed the eviction and “done their job”. They said they would then leave and the Garifuna should return their belongings to their homes. 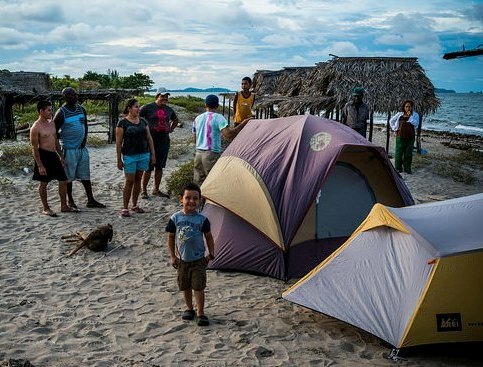 In side conversations, they encouraged the residents of Barra Vieja not to leave their community as this was obviously motivated by the ambitions of the nearby Indura hotel resort to consolidate a much larger beach area for their hotel business. Doña Norma Quioto, a longtime resident of Barra Vieja, photo by Steve Pavey. Norma Quioto, an elderly lifelong resident of Barra Vieja, told us that her parents and grandparents had lived there and that her mother was born there (literally born there, in a home birth). 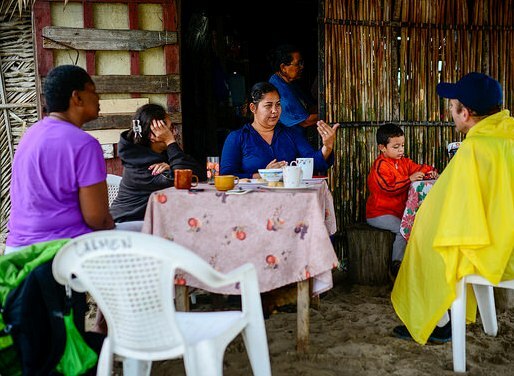 Norma had sent away her grandson to a relative’s home in Tela as she did not want him to suffer more trauma than the community had already suffered due to these attempts at forceful eviction. That night as we settled down in our tents to sleep, a team of 10 men and 5 women gathered to patrol the community through the night, with breaks to drink coffee. A sympathetic person had informed them that individuals in Tela had been sought and offered money to come and burn homes in Barra Vieja, so the community was on 24/7 watch with rotating teams of neighbors. This was fortunate for us that night as heavy winds from the north out in the Caribbean caused the fly of one of our tents to come off allowing rain to drench us, and one of the local vigilers helped me in the dark to restore our shelter so we could get some sleep, wet but warm enough to doze off. A hearty breakfast in the morning offered by our gracious hosts (who had been awake all night, see photo below) restored us. Our gracious host and community leader and her son. Photo by Steve Pavey. Later in the morning we witnessed a great joy. A fishing boat pulled up off shore loaded with fish just caught in one of the community’s nets. 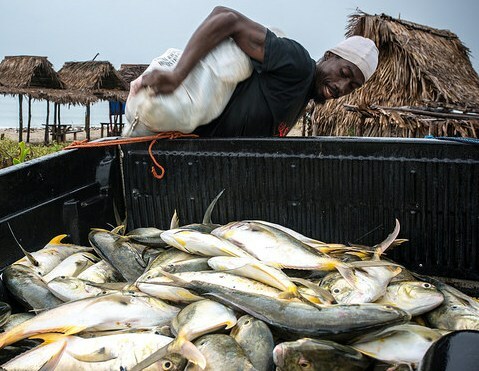 Community members of the cooperative ran back and forth from the heavily loaded boat to a pickup truck on the dunes with what looked to be an entire school of very large fish, they would sell for 30 and 50 lempiras each according to size ($1.50 to $2.25 USD). Each large fish appeared to weight five to seven pounds! 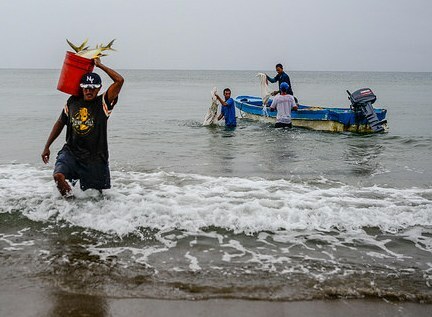 The abundance of the sea to sustain the people of the community, working cooperatively, would have been lost if Barra Vieja were converted into just another stretch of tourist resort.